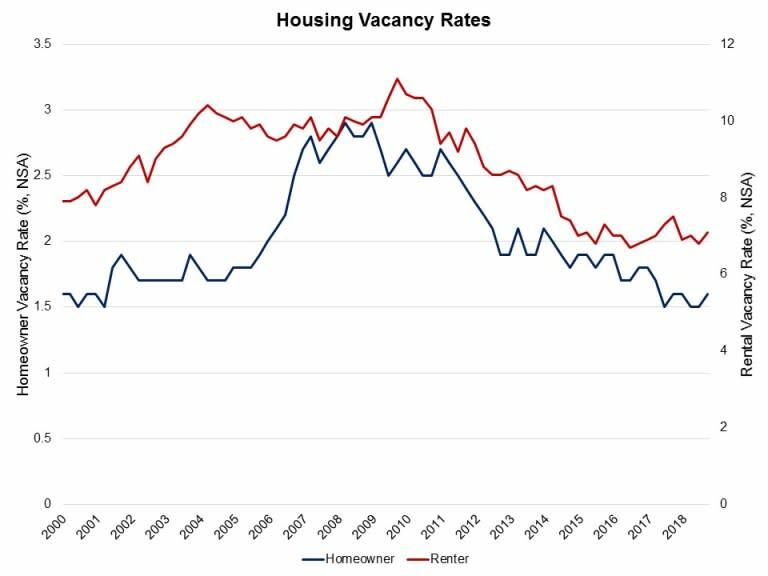 According to the Census Bureau’s Housing Vacancy Survey (HVS), the U.S. homeownership rate was 64.4% in the third quarter of 2018, which is not statistically different from its last quarter reading. The national homeownership rate demonstrated stability during a quarter in which housing markets softened due to declining affordability conditions. This follows the rate dropping to a cycle low of 62.9% in the second quarter 2016. 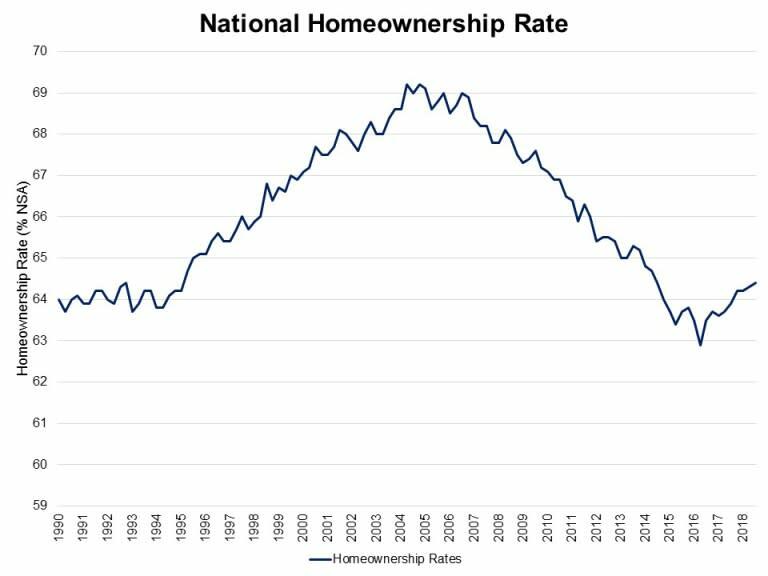 Compared to the peak of 69.2% in 2004, however, the homeownership rate is still lower by almost five percentage points. The count of total households, however, increased to 121 million in the third quarter of 2018 from 119 million a year ago. Newly-gained households are predominantly owner households, while renter households only increased by 60,000. 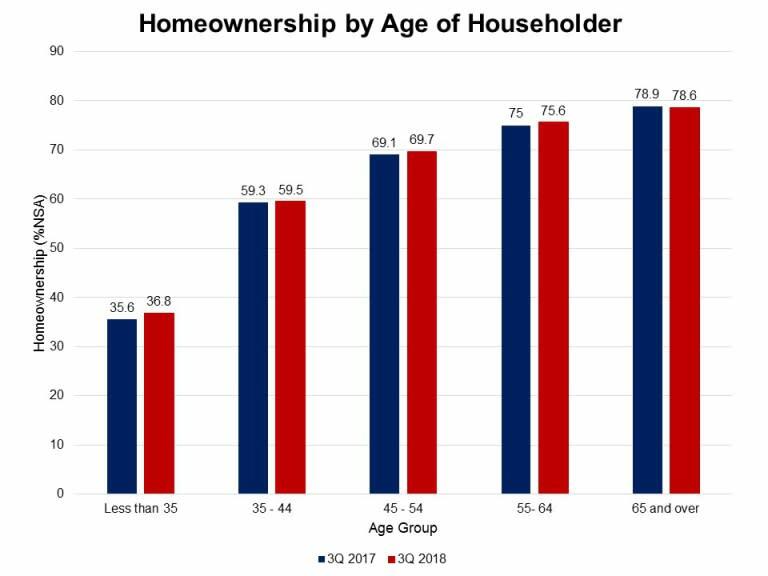 The homeownership rates among all age groups under 64 increased over the last year. Millennial households, mostly first-time homebuyers, registered the largest gains among all households, a 1.2 percentage point increase from a year ago. Millennials are gradually returning to the for-sale housing market, where gains in home price are slowing down. The homeownership rates of households ages 45-54 and 55-64 experienced a 0.8 percentage point increase. The nonseasonally adjusted homeowner vacancy rate remained low at 1.6% in the third quarter 2018. At the same time, the national rental vacancy rate went up to 7.1%, up by 0.3% from the last quarter. The HVS also provides a timely measure of household formations – the key driver of housing demand. Although it is not perfectly consistent with other Census Bureau surveys (Current Population Survey’s March ASEC, American Community Survey, and Decennial Census), the HVS remains a useful source of relatively real-time data. The housing stock-based HVS revealed that the number of households increased to 121.4 million in the third quarter of 2018, 1.6 million higher than a year ago. The gains are largely due to strong owner household formation. 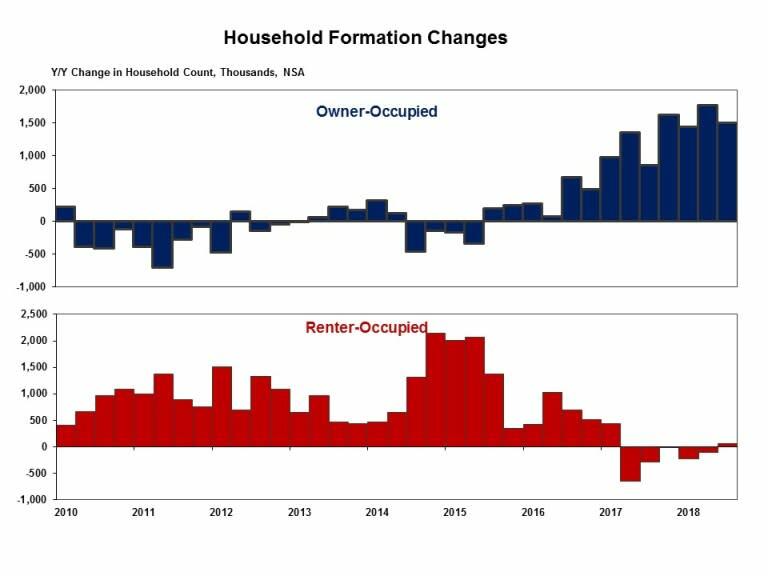 Indeed, the number of homeowner households has been rising since the third quarter 2016, while the number of renter households has been on the downward trend. In the third quarter 2018, the number of homeowners increased by 1.5 million, while the number of renter households rose by 60,000. © 2017 HBA of Greater Little Rock. All Rights Reserved. Site by GrowthZone.